If your anxiety is pretty severe, you may want to try going down even further to low Alpha 8.5Hz, with my Anxiety Relief session. For severe stress, my Stress Relief isochronic tones tracks go down even further to 6.5Hz in Theta. At the other end of the scale, people suffering from depression will usually show an abundance of slower wave brain activity, when studied on an EGG. 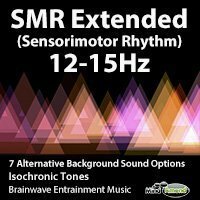 In that situation, listening to SMR 12-15Hz stimulation can help to increase the speed of brain activity, improving your mood, energy levels, and reducing the feelings of depression. If you're someone who often experiences anxiety and depression, it's not always helpful to increase theta and low alpha activity, because that might bring on feelings of depression. Likewise, if you're feeling depressed, increasing your dominant brainwave activity too high, could potentially bring on anxious feelings. This is when the SMR range is the best option, because it falls around the middle and can help to bring up people from depression, and or bring someone down from an anxiety episode at the same time, without the worry of triggering the other condition. People with insomnia, are often found to produce a lower than average amount of SMR brainwave activity. Listening to SMR 12-15Hz stimulation during the daytime or early evening will boost your natural SMR levels, and help you to combat insomnia. Athletes and very fit and healthy individuals, usually show higher levels of SMR activity on an EEG. On the flip side, people who are ill with serious medical conditions, will often be found to have much lower SMR levels. So while I'm not suggesting SMR stimulation is a cure for all illnesses, because there hasn't been enough research in this area yet, there does appear to be a correlation between good health and higher SMR levels, and poor health with lower SMR levels. My original Sensorimotor Rhythm session is 24 minutes in length. After getting various requests for something longer, I have just released SMR Extended, which is a much longer 3 hour session. This new longer session follows the same 12-15Hz frequency cycle of the original, but I've also added 6 new background tracks, to give some variety for those who already have the shorter version. The tracks with background music, also contain amplitude entrainment effects embedded into the music, for an increased entrainment effect.